Season 3, Episode 5. 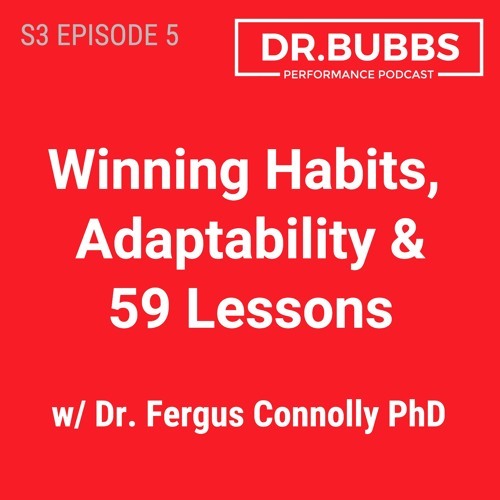 Dr. Bubbs interviews renowned sport scientist Dr. Fergus Connolly PhD to discuss the 59 Lessons he’s learned throughout his illustrious career in elite and pro sports. In this episode, Fergus shares how 99% healthy is not 100% injured, how he learned the value of quality of effort from legendary coach Big Sam Allardyce, the importance of listening more than you talk, why it’s essential to “keep the main thing the main thing” if you want to perform at your best, how your “ability to adapt determines your ability to succeed”, why the fight is won before you take the field and much, much more. Don't miss this episode and check out drbubbs.com/podcast for full show notes.